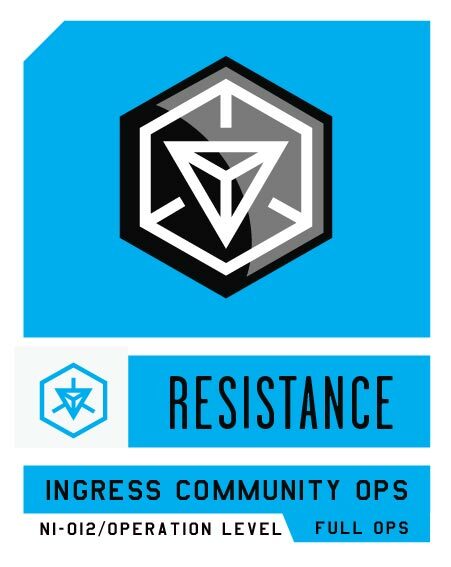 Are you looking for an invite for Ingress? Got creative skills? 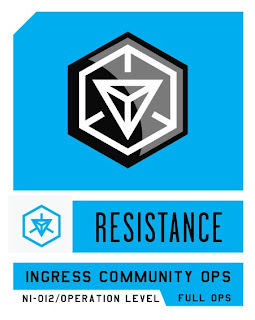 Well, we're looking for a new logo and we've got a couple of Ingress invites to give away. We'd like to improve the look of Japan Mobile Tech, so we're soliciting submissions for a new logo. Or a new header image. Or both. Maybe even some backgrounds for sidebars divs. We're really just looking for a means to give away these invites and think the old "retweet / share / like" contests are dumb. If we use your submission, we'll give you an invite. Even if we don't use your submission, we may still give you an invite (if we have enough). Submissions must be 1) original work or 2) derivates of work with appropriate licensing. Our selection criteria is entirely subjective and not at all based on the overall artistic merit of any particular submission. Selection for use by JMT grants us license to use and create derivates of the work. We retain no license of work that we do not select to use. We will not use it later for some other purpose. This is provided with no warranty or guarantees at all. If you receive an invite you are free to play as enlightenment or resistance, but note that all contributors to JMT are resistance, and all (except some guy named Sven) of those in our G+ communities are also resistance. For the most part, we have no idea what we want, and have never felt like putting in the effort to figure it out, so that's the reason that this site looks the way it does. Do as much or as little as you like. Limit it to a new logo, or add in header artwork or sidebar backgrounds if you like. Submitting more does not necessarily increase your chances of being given an invite, though we expect to have more than one invite to give away, so we hope to be able to reward those who submit good work, even if we don't use it. Overused images/artwork of Mt. Fuji, samurai, the Japanese flag, etc., are unlikely to be selected, unless they're just really darn good. JMT is now most focused on carriers, mobile technology (not limited to Android, though that is a primary focus, we also consider other platforms), and communications technology in Japan. We are NOT looking for ingress themed artwork. Our sidebar is currently 310 pixels, and the main div is fluid with a maximum width of 1600 pixels (to make viewing this post easier). We prefer fluid main divisions. Having the layered PSD (or whatever) files will allow us to best adapt the artwork to any future layout changes. It has been recently reported that NTT Docomo is developing a new mobile operating system to compete with Apple and Google. Plans are for shipping a Samsung device loaded with this "new" OS, known as Tizen, sometime during 2013. Many seem to be left with the impression that NTT Docomo is developing, from the ground up, a brand new OS. However, it is difficult for mobile phone service companies to offer their own services, such as for Docomo's online shopping, or to improve the safety of personal information for the smartphones equipped with the OS products developed in the United States. To put it bluntly, what a total load of crap. Docomo's ability to secure (or not) the personal information of subscribers has nothing to do with whether the OS was developed in the United States. Yes, with the inevitably smally number of Tizen apps that will be initially available, Docomo will be easily able to screen each and every one for malware and addressbook harvesting behavior, but this model would not scale if Tizen gained the popularity of Android, and I don’t at all believe that Docomo would do a better job than Google of protecting personal information. Docomo's ability to offer their own services also remains unaffected by the their adoption of Google’s OS. Yes, Android did disrupt carriers’ ability to charge for services that should have always been free, such as copying music and other media to their phone. Google offers for free stuff that Docomo did, and would like to again, sell. In contrast, the basic technology information used by Tizen will be made open to the public and the OS is being developed on the premise that mobile phone service companies will be able to offer their own services. This is also a load of crap*. Tizen will be released under the same Apache, GPL and similar licenses, such as Flora (Not sure how this differs from Apache) as Android. The structure of the Apache license is why Android has been successful. It allows makers to make modifications to the OS, adding for example a proprietary UI (like HTC Sense) without being required to release all the modified source code. If Google had released Android under the GPL, the major handset makers would have been much less likely to embrace it. *if comparing to the iPhone, then yes, but the same article claims that iOS only has 14% of the smartphone OS market share. As the above graphic shows, mobile Linux development predates both Apple’s iOS and Google’s Android. There have been a number of attempts at developing a viable linux-based mobile OS, and some showed real promise, though none were successful. Essentially, these efforts led to Tizen. NTT Docomo is by no means the main force behind Tizen, which is partially (but not entirely) a rebranding of the LiMo (Linux Mobile) Platform. (NTT Docomo released several LiMo handsets.) The founding partners of LiMo were NEC, NTT Docomo, Panasonic, Samsung, and Vodafone. 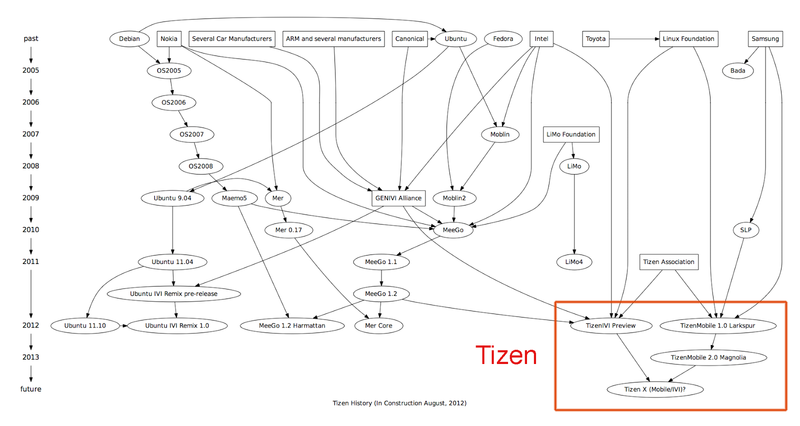 Now as Tizen, the Board of Directors is comprised of 12 companies, with Huawei, Intel, Orange, SK telecom, Sprint, and Telefonica joining the original LiMo members. Note two US companies there: Intel and Sprint Softbank Mobile. The former brings extensive experience in mobile linux development to Tizen. The inclusion of the latter could be interesting. Intel previously developed The Mobin OS, which was merged with Nokia’s Maemo OS to create the ill fated (but crtically well received) MeeGo OS that was featured in the Nokia N9. In September-October 2011, Intel left for LiMo, and the Linux Foundation cancelled support for MeeGo. Nokia has since abandoned Linux development, opting for Windows, and MeeGo was shelved (until recently when a Finnish startup staffed by several ex-Nokia folks rebranded it as “Sailfish”). Following this, exactly one year ago today, LiMo was renamed Tizen with the merger of a number of unsuccessful linux-based mobile operating systems. As stated above, considering what Intel brings to the project, this is more than just a simple rebranding. However Tizen is still a long shot as far as mobile phones and tablets are concerned. NTT Docomo could see some limited success, at first, by marketing to the demographic who still cling dearly to their Galapagos feature phones. Converting existing Android users, much less iPhone users, is simply never going to happen. Arguably, Windows Phone has better odds, and it’s odds are slim. While we were mildly impressed by some of Docomo's recent apps, most of their attempts at differentiation have been terrible (Pallet UI). Even if the Tizen OS turns out to be excellent, without attracting app developers, it will ultimately fail. Here is some of what NTT Docomo is probably thinking. Recover revenue lost after giving up the walled garden model (that is exasperated by fierce competition in data/voice fees from smaller domestic carriers). Enjoy total control of the content available to it's customers and get the 30% transaction fee that Google gets for sales of apps on the Play Store. Differentiate its offerings from other domestic carriers. License it's own OS to handset makers. Be as successful as Android.